As an accountant or bookkeeper in Australia, you know how challenging it can be to assess a prospective client’s books with limited knowledge about their history or business. You’re trying to determine the time required to clean up the books and what to charge, but understanding the state of the books is a time consuming process itself, and mistakes or surprises can lead you to under price your services, which means time wasted and money lost in the short and long run. What if there was a powerful solution to speed up this entire process and give you confidence to price your services more accurately? 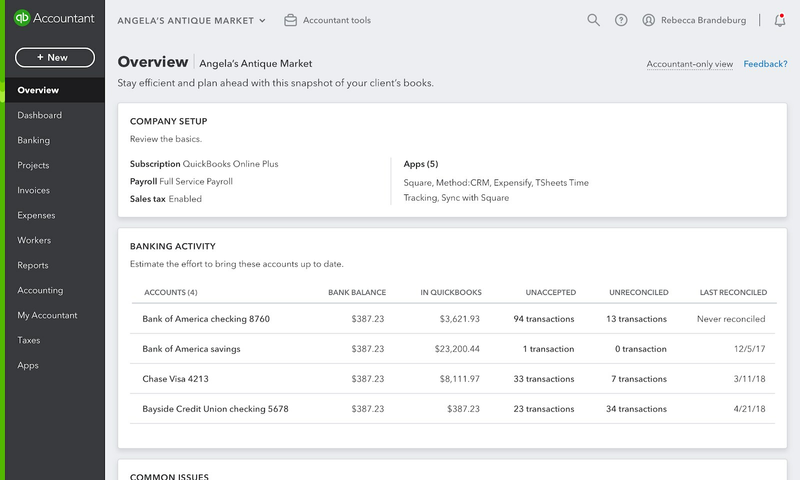 With the release of the new Client Overview feature inside QuickBooks® Online (QBO), there is! A better understanding. Get a high level understanding of the state of the books with a unified view of relevant setup, banking and account data. Take control of your pricing. Better estimate the pricing for initial cleanup, with upfront visibility into how updated the books really are, while improving your pricing strategy with data insights that indicate the complexity and required effort to clean up and maintain the books. More transparency. Better evaluate the required ongoing workload with information on the client’s company setup and business activity insights that reflect the prospect’s proficiency with QBO. Simple and efficient. Get to where you want to go in fewer clicks with deep links that take you directly to relevant transaction reports, specific bank accounts and the reconciliation tab. It’s very simple. When you access a prospect client’s QBO account through QuickBooks Online Accountant, you have a new Overview tab inside QBO (visible to accountants only), which provides relevant and actionable data to kick – start your initial file review. Client Overview will help you identify signals that indicate how much effort would be required to clean up the books and then maintain them on an ongoing basis. Only with a decisive understanding of the ‘state of the books’ can you satisfactorily determine the projected outcome. Access Client Overview through QBOA to save time and price your services more accurately. Chances are you’ll have an opportunity to try our Client Overview right away; the very next time you find a prospect, you can use this new feature to quote the work more accurately, while getting a better idea how organized the books are. And, you will gain the prospect’s trust because you’re already demonstrating your knowledge of accounting and QBO. That’s a win – win for everyone! In a nutshell: New and improved QuickBooks Online invoices have a clean and simple layout. With the new itemised invoices, you will be able to easily understand your monthly subscription charges and how they flow into each client relationship. The first section provides a snapshot of your total subscriptions for each QuickBooks Online product including those bought with a package. In the next section, you’ll see the unit price, taxation, and total billed for your Plus and Essentials subscriptions, as well as Plus subscriptions purchased on a package discount. In the Billing by Client section, charges are listed by client including taxation. No more calculating client bills by hand! This will save you valuable time when you bill your clients every month. Lastly, the invoice provides your total tax charges for the month to make tax preparation smoother. Recently we enhanced the bulk reclassify functionality in QBOA so it now allows an advisor to reclassify GST transactions in bulk. The enhanced feature will reduce the need for transactions to be edited at a line item level saving time and reducing the chance of error. What properties can I reclassify in bulk? How does sales tax reclassification work? I have many transactions in my file and when I list all of them, they span multiple pages on the bulk reclassify screen. Can I select transactions spread across different pages and reclassify all of them at once? How many line items can I reclassify in bulk? The maximum number of line items that can be displayed on a page is 300. So you can reclassify up to 300 lines in one go. I tried to reclassify 100 line items and I got an error that a few transactions cannot be reclassified. Can I still go ahead with the others? Can I undo a bulk reclassification transaction? No, bulk reclassification cannot be undone.